This entry was posted in Uncategorized on January 7, 2019 by dk. If you follow health-related news, you’ve probably come across the term “biohacking” recently. 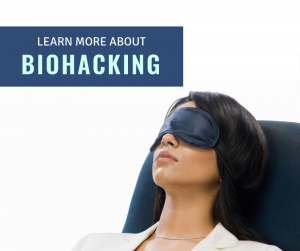 The word itself might sound intimidating to the average person, but the concepts behind biohacking are actually quite simple: The goal is to “hack” your body’s natural processes to improve your physical, emotional, and cellular health. Taken to extremes, biohacking’s “citizen science” approach can lead to unsupervised experiments outside of conventional research facilities. Extreme biohackers pursue activities such as trying to alter their DNA or implanting cybernetic devices into their own bodies. That’s not necessarily a safe or recommended approach! Fortunately, you don’t have to track every nanosecond of your day or spend a small fortune to benefit from biohacking best practices. Biohacking your health can be as easy as applying the latest scientific discoveries to your own life and adjusting as you go. That’s always a good approach to our well-being. One of the central tenets of biohacking is that the things you put into your body (what you eat, the air you breathe, the sounds you are exposed to) shape your body’s output (your energy, productivity and moods). Your mitochondria are at the heart of this process. Mitochondria are the “batteries” that give energy to every cell in your body. These tiny powerhouses are easily influenced by their environment – in other words, they are impacted by everything your body is exposed to. When you improve their environment, you can improve the energy produced by mitochondria. The results? Far-reaching improvements on your overall health and energy levels. That means paying close attention to how you feel, but the results are definitely worth it. By improving cellular function, biohacking your basic daily activities can have noticeable benefits. And it can be fun. After all, who doesn’t want to use science to feel better every day? Check out some easy ways to biohack your own health. The results might surprise you! Focus on natural products. Even if we’re careful about what we eat, our bodies are still exposed to harmful elements as we go through the day. The water we drink, the substances we clean with, and the beauty and grooming products we use can all hold harmful toxins. These toxins impact our cellular health in ways we may not even realize. Consciously seeking out natural beauty products and non-toxic cleaning solutions can help you assess the impact of toxic ingredients on your body. Improve your sleep. By adjusting our night routines, we can improve the quality of our sleep. Biohackers look beyond the standard advice on improving sleep to carefully consider what we surround ourselves with at bedtime. For example, you may have great results by reducing the amount of blue light you’re exposed to at night. Blue light comes from electronic devices. What can be a helpful practice is staying off your devices for 3 hours before bed or switching your devices to “night mode.” Reducing the temperature in your room and minimizing exposure to electromagnetic fields can also lead to world-class sleep. If you’d like to look deeper into your current status of health, find out if your hormones are causing issues in your body or learn how you can take your health to the next level, come into the office and let’s talk. We are experts in looking at the individual as a whole and creating a unique plan to get your body functioning its best. ← Is Alcohol Really a Detriment to Your Health?